If you would like to find out more about W4C, or spread the word on our surf therapy mission, please feel free to download and share these two W4C information resources. Waves For Change (W4C) was founded by Ashoka Fellow Tim Conibear, who spent time in South Africa after graduating from university in the UK. An avid surfer, Tim spent every free moment he had surfing. In 2009 he started a small surfing club in Masiphumelele Township. The club centred around voluntary weekend surfing sessions, which soon grew when local community members – Apish Tshetsha and Bongani Ndlovu – volunteered to lead and expand the club. Mikey February – Mikey is one of South Africa’s rising surfing stars. A Quiksilver Team Rider and regular on the WQS, Mikey hails from Cape Town and is one of South Africa’s big hopes. He’s often in the Waves for the Waves for Change Team and we’re stoked to work with him to push the Surf Therapy envelope in Africa. 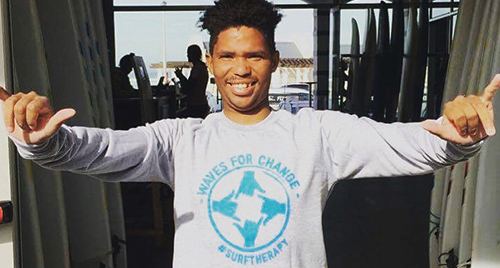 We’re so excited to have Alfonso Peters as a Waves for Change ambassador and friend. Alf, a Muizenberg local, grew up in some of the most violent areas of Cape Town, and was on a dangerous path before surfing changed his life. Alf understands the power of the ocean, surf therapy and sport for development, which makes us extra stoked to welcome him into our family.